Pet owners asked to take precautions as National Weather Service predicts up to 8 inches of snow, wind chills of minus 35 by Friday morning. As central Maine enters a deep freeze that is expected to include wind chills nearing 35 degrees below zero, an animal shelter is asking pet owners to take special precautions to protect their pets from the worst of the weather. Poor visibility, dangerously low temperatures and up to 8 inches of snow are predicted to hit central Maine by Friday morning, according to weather forecasts. Heavy bands of snow and strong winds Thursday threatened to create near-blizzard conditions in Maine to be followed by the coldest weather in three years — conditions severe enough that even skiers were reconsidering going outside. With the snow and temperatures expected to plummet to 30 to 35 below zero Friday night in the mountains for the coldest weather since 2011, Gov. Paul LePage sent workers home early in nine counties. Electric utilities that had to deal with 160,000 power failures during the ice storm last week said crews were ready to return to work to restore power if winds gusting to 35 mph caused more problems. 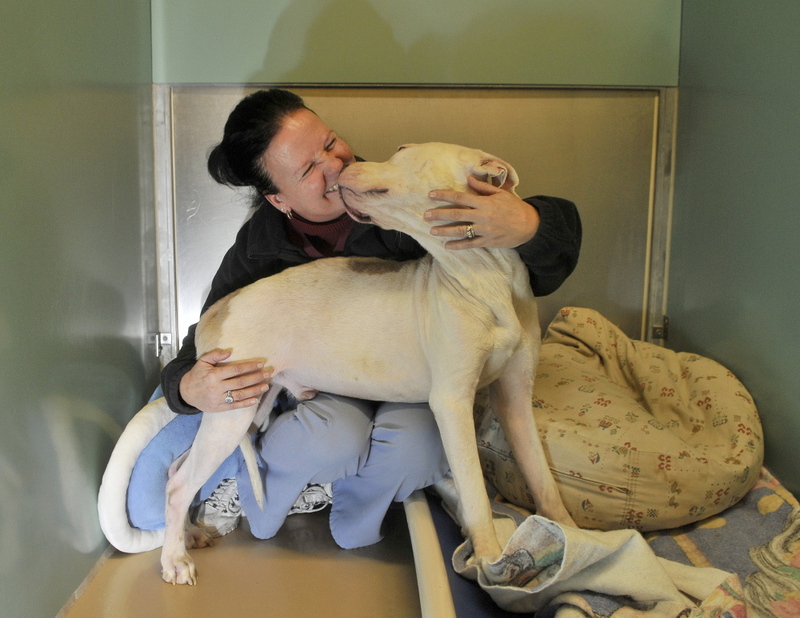 The importance of protecting pets from the chill took on extra meaning for workers at the Waterville Humane Society on Webb Road when the shelter took in a half-starved pit bull suffering from frostbite Saturday night, according to shelter director Kathleen Ross. A local couple found the white dog with fawn-colored spots wandering the rural roads of Rome about 10 p.m., and they worked with an off-duty police officer to coax the dog into their car using sausages as bait, said Ross, who is also Rome’s animal control officer. “If the dog hadn’t been picked up on Saturday night, it would not have survived Sunday night,” Ross said. 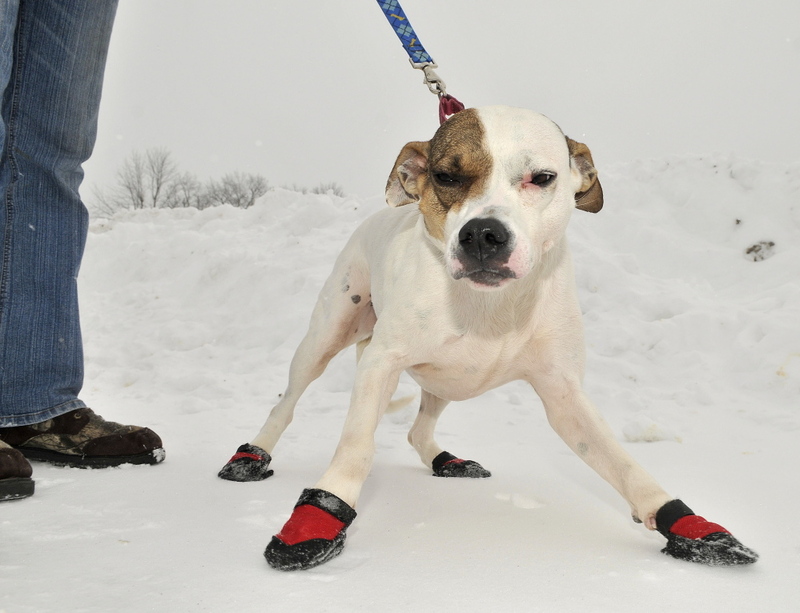 Pam Nichols, the shelter’s kennel manager and a former veterinary technician, said the signs of frostbite were widespread on the rear legs, foot pads and ears of the dog, which at first refused to walk. Nichols said the flea-ridden dog, which they named Chance because it has received a second chance in life, was extremely thin and seemed to have received no socialization. Chance’s weight is a sign of long-term food deprivation, she said, but his frostbite could have happened very quickly, especially if he got wet while crossing a small stream. For homes across the region, frostbite will be a real danger for many humans and pets on Friday. 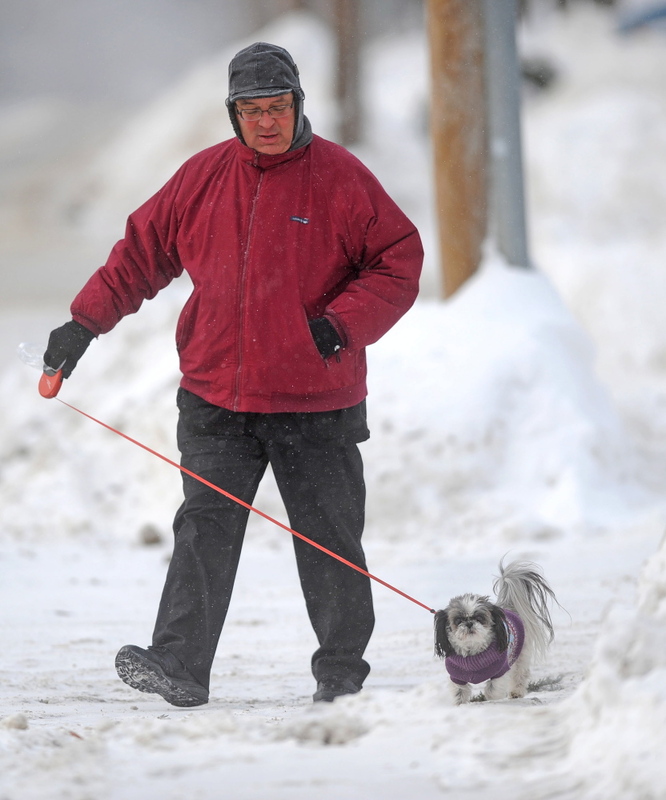 Some pet owners reported that the cold weather was forcing them to take shorter walks with their dogs. 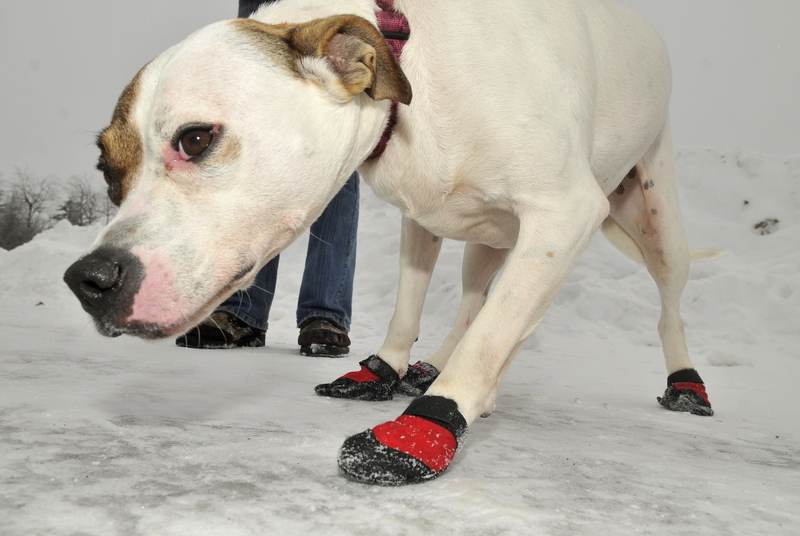 The skin of a person or animal is susceptible to frostbite at temperatures slightly below freezing. At about 28 degrees, the tissue will begin to freeze, according to the Mayo Clinic. The colder it is outside, the more quickly frostbite can happen, and on Friday the temperature will get “darn cold,” according to Margaret Curtis, a meteorologist with the National Weather Service in Gray. The weather service predicted 4 to 8 inches of new snow accumulation by Friday morning in the Augusta and Waterville areas. The extreme cold temperatures and wind gusts are expected to contribute to poor visibility, as fallen snow is stirred up into the air to mix with the snow that is still falling. According to an advisory, north winds with gusts of up to 25 mph will produce a wind chill of as low as 27 degrees below zero Thursday night. Somerset County will see less snow, at an estimated 3 to 5 inches, but will have even colder temperatures, with a wind chill of as low as 35 below. The advisory, in effect until 1 p.m. Friday, also asked that animal owners protect their livestock and move pets inside. Curtis said the cold will lose some of its bite as the week ends. “The good news is the snow and the wind will end Friday morning,” she said. Friday will have highs in the single digits, while Friday night will see lows of 15 below. On Saturday, the high will be near 20 degrees, and on Sunday, the high will be in the upper 20s. “Twenty never sounded so warm,” Curtis said. The layer of ice that has been coating trees in central Maine since the ice storm that began Dec. 22 will stick around into the weekend. Curtis said on Monday, the temperature will finally go above freezing for the first time in more than a week, which could melt much of the ice and relieve some of the stress on the trees. Outside Portland, the Smiling Hill cross-country ski center closed for the day, saying bitter cold and wind gusts made conditions too dangerous even for winter sports enthusiasts. “It sounds counterintuitive to close cross-country skiing and snowshoeing due to snow and a blizzard. But if you get people on the trail in whiteout conditions, there’s a possibility they can’t make it back. Then it’s a rescue operation,” Warren Knight said, explaining the decision to close the 500-acre farm. Most people were simply staying inside to stay warm. That included all but the hardiest of skiers. Mariners also had to contend with the unusual cold and resultant ice. A freezing spray advisory was in effect for commercial fishing boats operating in the North Atlantic, where temperatures were so cold that fishing boats could accumulate nearly an inch of ice per hour, according to John Cannon, meteorologist from the National Weather Service office in Gray. At the shelter, Ross said dogs were being taken out to go to the bathroom very quickly, rather than being allowed time to play outside. Some were having their feet protected with booties, even for the short walks. Ross urged pet owners who are used to keeping their pets outside to recognize the extreme temperatures and make sure their dogs and cats are comfortable. Even cold-loving dogs like huskies and Chows need to have adequate shelter, including a raised bed in a completely enclosed shelter that has no open faces or severe drafts. “It’s got to be so that the elements can’t get inside,” she said. She recommended hay over blankets, because blankets absorb water and get wet more easily, making it colder. Short-haired breeds need a heated shelter, she said. When they go outside, they should be protected with sweaters and booties. All dogs should be given a little more food than usual, and owners should work hard to make sure they have access to clean water. Some dogs will eat snow in desperation, she said, but that just lowers their internal temperatures more. In severe cold, food that is put outside for pets is also more likely to attract wild animals that are more desperate than usual to find food. For Chance, the pit bull found on a road, life’s problems will go beyond frostbite. It will take time for him to gain enough weight to recover, and his mental scars will likely last even longer. At the Humane Society, Nichols and Ross said he is so frightened of people, other animals and noises that he can usually be found cowering under his bed. But he seems to have at least a chance at a brighter future. The couple that found Chance were in mourning because their own dog had died recently, Ross said. They had decided that they weren’t going to get another dog, but they’re having second thoughts.